On February 13, 2018, Michael Adams, professor of sociology and criminology at the University of North Carolina – Wilmington, plans to speak as the Jeff Cole Distinguished Lecturer at the University of Montana, a lecture series organized and funded by Maria Cole. The University of Montana Chapters of the National Lawyers Guild (UM-NLG), OUTlaws, Women’s Law Caucus (WLC), and Native American Law Student Association (NALSA) call on the University of Montana (University) to quash the perception that Professor Adams and his hate-based rhetoric is distinguished and validated by the University. Professor Adams perpetuates antagonistic rhetoric against the LGBT+ community, women, people of color, and Muslims. He has a history of making xenophobic, misogynistic, and racist statements, found on his twitter feed, his Townhall column, and highlighted by NBC. Silence in the face of these ideas is dangerous, and honoring a speaker who peddles bigotry with a distinguished lecturer award is unacceptable. The UM-NLG, OUTlaws, WLC, and NALSA strongly condemn Ms. Cole’s decision to invite Professor Adams and the University of Montana’s tacit approval. By offering a platform to speak at the University to someone that promotes hate-filled rhetoric, Ms. Cole, and the University by association, is conferring legitimacy on Professor Adams’ position. Hateful and harassment-based speech should not be promoted. In the new era under University President Seth Bodnar, we urge President Bodnar to reaffirm the values enumerated by the University in its policies against Discrimination and Harassment. By tacitly honoring Professor Adams as a distinguished lecturer and providing a University venue to espouse his views, the University is contradicting our mission to craft “informed, ethical, and engaged citizens.” Inviting and endorsing speakers who promote discriminatory, hate-filled messages negatively impacts our campus and the Missoula community. The University of Montana has a rich diversity, including people of color, LGTB+ people, and people of the Islamic faith. 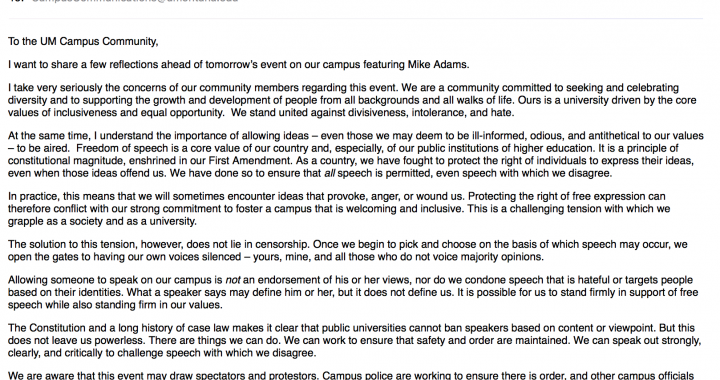 Providing a University platform for speakers like Professor Adams, that have a history of spewing hateful and harassment-based messages, creates an unsafe environment for people who are already marginalized and vulnerable. The University must speak for our community and in accordance with policy 707 on discrimination and harassment. We do not challenge Professor Adams’ right to express his views. However, possessing the right to speak does not confer the privilege of speaking on our campus with the tacit approval of the University. The identity and the worth of our community members is not up for debate. Above: Success! Following the delivery of the above statement (which was reprinted by the Missoulian), UM President Seth Bodnar sent this email to the entire UM community distancing the school from the talk. Posted in Announcements and tagged alt-right, Education, NLG Students.